Well it is a pretty good thinking and imaginable that a person could actually access a file of the computer remotely from his mobile phone. Actually this inevitable task is now possible for smartphone users, where a person having an iPhone can actually access any kind of file from its computer remotely with Slpashtop App. 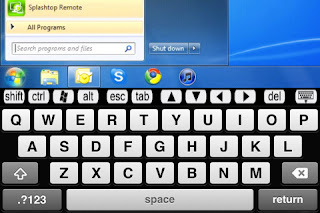 Splashtop Remote Desktop is a new app devised by DeviceVM which has found its way to the App Store; can actually connect the smart phone into the PC. It is pretty sure that this app will allow the user to watch movies, listen to music and even accessing any data files which may include web browser. The only shortcoming is that this method will work only for Wi-Fi networks and not over 3G networks. Splashtop is available for other iOS devices like the iPhone, iPad and iPod Touch. This app requires iOS 3.2 and is even compatible with iPhone 4. Download iPhone version of the app HERE. Download iPad version of the app HERE. 5 Free BlackBerry Apps You Must Have ! Best iPhone Games from Sega on SALE! How to Jailbreak iOS 4.2.1 with RedSn0w? Turn WP7 Phone into USB Device! GreenPois0n Jailbreak for iPhone iOS 4.2.1 Soon! How to increase iPhone Memory? Unlocked Motorola Milestone 2 to launch in UK! Calling Off Free iPhone App Giveaways! NFS Hot Pursuit $4.99 iPhone App Free Giveaway!! How to Get Refund for iPhone App? Samsung Galaxy S Successor with dual-core? Convert iPhone to 3D Theater! Best Android Games People Are Addicted To! Best Photography iPad Apps ! Free Android Apps to Increase Your Productivity! World's Toughest Phone for 70 Pounds! Top 10 Phones of the Year 2010 !! Android 2.2 Sense For HTC Aria Leaked!